This is the door pull handle on the window molding of Model A Ford Cabriolets and Fordors. Steel window garnish for the fixed back window. Fits: 1928-31 Tudor sedan, 1928-31 Coupe, 1928-29 Special Coupe, 1929-31 Fordor Sedan, 1929-31 Town Sedan (Briggs 155-B/D), 1929-31 Std. Fordor (Briggs 154-B/D, 170 A/B), 1929 Fordor (Briggs 60-C), 1928-29 Taxi Cab (135-A) and 1928-30 Deluxe Delivery (130-A). Made in USA. Steel window garnish for the roll-down rear window. 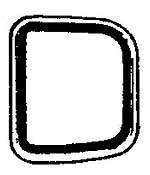 This deeper garnish was used on the 1930-31 Coupes that had the roll-down style rear window. Made in USA. 1928-31 Sport coupe rear window frame. Outer frame is polished stainless, inner is powder coated tan. Frame is 9-9/16" tall, 20-5/8" wide. Made in USA. Fibreglass garnish moulding for the quarter windows of the 1928-29 Model A Ford Coupe. Made in USA. 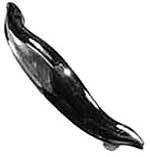 Fibreglass Right Quarter Window Garnish for the 1930-31 Coupe. Made in USA. Fibreglass Left Quarter Window Garnish for the 1930-31 Coupe. Made in USA. Garnish moulding For the 1931 Slant Windshields Front Door. The Slant Windshields and the Victorias used this piece of garnish under the regular garnish at the bottom of the window opening. Made if steel. Made in USA. Garnish moulding For the 1931 Slant Windshields Rear Door. The Slant Windshields and the Victorias used this piece of garnish under the regular garnish at the bottom of the window opening. Made if steel. Made in USA. Quarter window Garnish moulding For the 1931 Slant Windshield. The Slant Windshields and the Victorias used this piece of garnish under the regular garnish at the bottom of the window opening. Made if steel. Made in USA. Garnish moulding For the 1930-31 Victoria Left Door. The Victorias used this piece of garnish under the regular garnish at the bottom of the window opening. Made if steel. Made in USA. Garnish moulding For the 1930-31 Victoria Right Door. The Victorias used this piece of garnish under the regular garnish at the bottom of the window opening. Made if steel. Made in USA. Garnish moldings For the 1930-31 Victoria Quarter Window. The Victorias used this piece of garnish under the regular garnish at the bottom of the window opening. Made in steel. Made in USA. Windshield header garnish 1930-31. This garnish goes above the windshield on 1931 Slant Wiindshield & Victoria. It is also referred to as the header upholstery retainer. Made of steel and primed. Made in USA. Steel front door garnish moulding set for the 1928-29 Coupe and Tudor sedan. A very good quality dye stamped garnish moulding. This is the part of the door that you grab when you close the door. Price is for a pair. Made in USA. Steel door garnish moulding set for the 1930-31 Coupe. A beautiful repo of the original garnish moldings! Very good quality! Set of 2. Made in USA. Front door Garnish Moulding Set for the 1930-31 Tudor Sedan and Closed Cab pickup. A very good quality dye stamped garnish moulding. This is the part of the door that you grab when you close the door. Set of 2. Made in USA. Garnish Moulding set for the 1928-29 Closed Cab. A very good quality dye stamped garnish moulding. This is the part of the door that you grab when you close the door. Price is for a pair. Made in USA. Steel garnish moulding set for the 1928-31 Tudor sedan rear side windows. A beautiful repo of the original garnish moldings! Very good quality! Set of 2. Made in USA. Metal strips that hold the glass in the back doors of the 1929 double door delivery. Sold in a set of 4 strips which is enough for 1 window. Made in USA. These are the garnish retainer clips used on 1928-31 Tudor Sedan rear side windows. Goes at the top rear corners to hold the garnish molding in place. 2 required per car. Made in USA. 1928-31 stainless steel garnish moulding 10/32 x 1/2 screw to mount the garnish molding to the door. Garnish moulding Tube Nuts. The tube nuts are used to mount the front window garnish moulding. (Included in our interior trim screws kits). These 6/32" tube nuts are used on the Model A straight windshield 4-door and the cabriolets. 3 nuts will be required per door. Made in USA. These tube nuts are used in the slant windshield 4-door Model A. (Included in our interior trim screws kit. 10 required per car. Made in USA.